Confined traditionally to the West's "Mormon corridor," faith sprouts from Alaska to Maine. 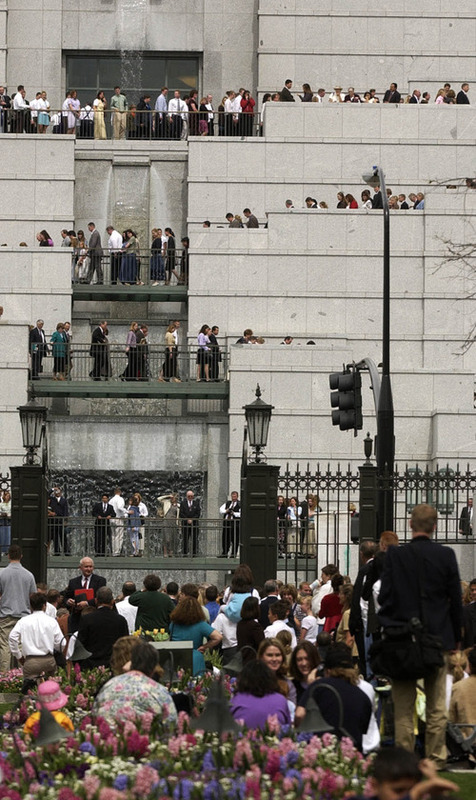 Crowds zigzag down the stairs after the first session of the 170th general conference of The Church of Jesus Christ of Latter-day Saints in Salt Lake City on April 1, 2000. 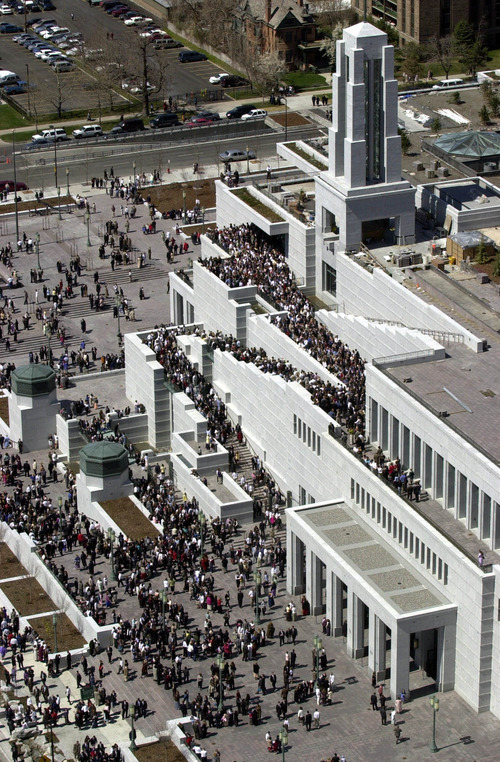 New figures show the LDS faith is the nation's fastest-growing Christian church. Rick Egan | Tribune file photo Tribune file photo Temple Square grounds in Salt Lake City are fully in bloom as conference-goers file out of the Conference Center after the morning session of the 172nd Annual General Conference of The Church of Jesus Christ of Latter-day Saints in 2002. New figures show the LDS faith is the nation's fastest-growing Christian church. 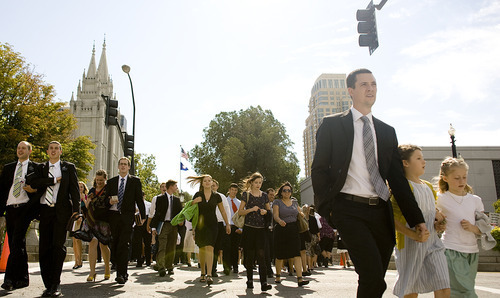 Jeremy Harmon | Tribune file photo Conferencegoers head toward the Conference Center in Salt Lake City on their way to the afternoon session of the 181st Semiannual General Conference of The Church of Jesus Christ of Latter-day Saints on Saturday, Oct. 1, 2011. New figures show the LDS faith is the nation's fastest-growing Christian church. What may be surprising, though, is where the Utah-based faith is leading the way  Alaska, Arkansas, Florida, Louisiana, Maine, Missouri, New Hampshire, North Dakota and other states far outside the West's traditional "Mormon corridor." These are among the findings of the newly released once-a-decade U.S. Religion Census, which includes county-level data on congregations for 236 American religious bodies, with data on adherents available for 153 participating bodies. The study was assembled by the Association of Statisticians of American Religious Bodies and included self-reported numbers from 17 of the country's largest religious groups. It is "the most comprehensive local-level analysis of U.S. religious adherents" since the religious census began about 60 years ago, Clifford Grammich, who led the study's supervising committee, said in a news release. "We are especially pleased to have increased participation for several independent and non-Christian bodies." In the latter category, researchers estimated that Muslims outpaced even Mormons between 2000 and 2010, adding 66.7 percent more adherents. During that time frame, the nation's overall Muslim tally shot up from 1,559,294 to 2,600,082. "The single largest religion in every state is Christianity," said Dale Jones, director of research services at the Church of the Nazarene Global Ministry Center in Kansas,"if one counts Mormons as a branch of Christendom  which the LDS Church does." That is "far and away the largest gain reported by any [Christian] group," the report noted, not just in percentage but also in actual numbers. "Surveys and statistics are sometimes helpful in understanding various aspects of the church, but, ultimately, we reach out to individuals, not numbers," LDS Church spokesman Scott Trotter said Tuesday. "By all indicators  including the church's building program  the church is growing and we are grateful that people are embracing the gospel of Jesus Christ." 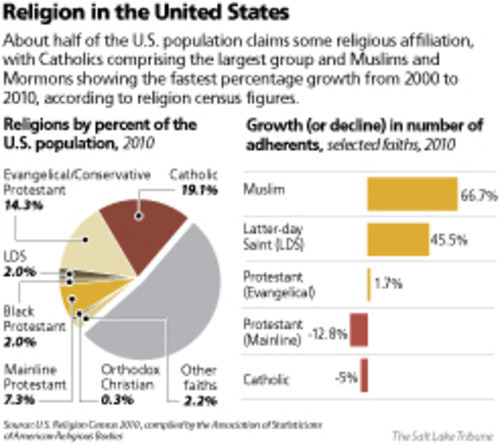 While LDS growth rates may be impressive, Mormons remain a small part (2 percent) of the U.S. population. In 30 states  including Arizona, California, Idaho and Utah  the LDS Church showed the largest percentage gains of any Christian group, Jones noted. Of course, many of these states  Rhode Island, Connecticut and Mississippi, for instance  have relatively tiny Mormon populations, so adding even a small number of members can produce a large jump in percentages. Catholics showed the largest gains in 11 states, including in Nevada, Colorado and Texas, and the Assemblies of God set the pace in three states (Illinois, Minnesota and Pennsylvania). In addition, the LDS Church is the largest religious body in 115 U.S. counties  that's 34 more than 10 years ago, he said. Between 2000 and 2010, according to this census, the Mormon population in Utah mushroomed the most in Tooele County, going from 25,837 to 38,888, a 50.5 percent bump. 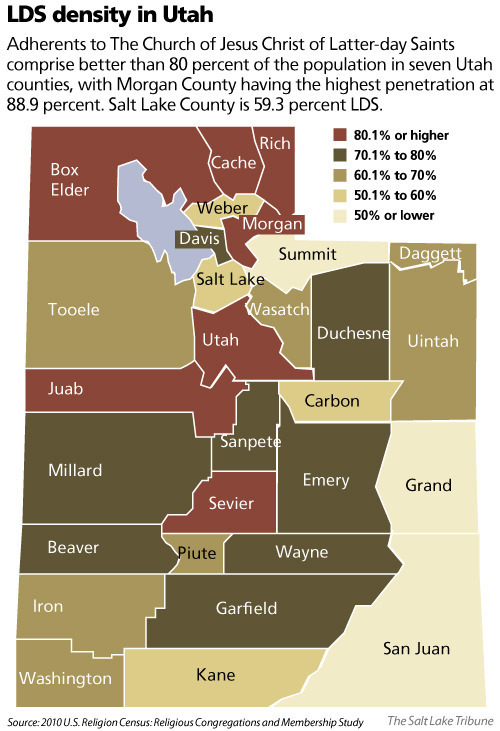 Morgan County has the highest percentage (88.9 percent) of Latter-day Saints, followed by Utah County (88.7 percent) and Rich County (88 percent). Ten years earlier, Utah County had the highest at 87.6 percent. These numbers are a bit higher than the ones the LDS Church supplies to the state for demographic purposes. A U.S. map of the total religious adherents by county also shows that Utah has the highest percentage of believers of any state. David Campbell, a religion expert at the University of Notre Dame and co-author of American Grace: How Religion Unites and Divides Us, attributes the swelling LDS numbers to several factors. First, many Americans are brought to Mormonism by its large volunteer missionary effort. Then there's the combination of a reasonably high LDS birthrate and reasonably high retention of those born in the faith. Campbell is not talking about the retention of new converts  a thorny problem for LDS leaders  but of lifelong members. "People who are raised Mormon are more likely to retain that identity when they enter adulthood," he said, "at least at a higher rate than other religions." Mormon immigrants from other countries could also be adding to the faith's numbers, said Campbell, a Mormon. Plus, the LDS Church's centralized bookkeeping makes it possible for the faith to keep track of members as they relocate, he said, whereas other Christian groups rely much more on individual or congregational reporting. When Southern Baptists, for example, move across state lines, it might take them some time to find a new congregation and be counted. Campbell does offer a caution about LDS membership numbers: It includes everyone who has ever been a member  even babies  and hasn't been excommunicated or asked to have their names removed from the rolls. Even Sen. Marco Rubio, R-Fla., who spent a few years as a Mormon during his childhood, is likely still on the list, Campbell quipped. It's a different figure for LDS membership than one that would include only those who self-identify as Mormons, he said. That is typically a much smaller number. But that's true, he said, for most Christian groups.